The Mobilock electronic bike lock, which opens via a smartphone app, has become the first in the world to receive an ART four-star quality standard. This officially makes the lock the safest bike lock in the world. For Mobilock, this recognition is the starting signal to work with even more companies and public transport providers to make the introduction of bike-sharing schemes possible. To make transport more sustainable and reduce traffic emissions, more and more cities in the Netherlands and abroad are introducing bike-sharing schemes. The big advantage of using Mobilock for this is that companies and local authorities do not need to invest in new bikes, bike clamps, payment columns or additional bike racks. The lock fits on all bikes, making it easy to share bikes without the need for infrastructure to store bikes at fixed places. Using the Mobilock app, users can see where they can pick up and return a bike, make any payment required and open and close the lock. "We make it possible to share existing bikes, which makes more people mobile without having to purchase more bikes," explains Walter Nieuwendijk, director and co-founder of Mobilock. The Mobilock app is based on the Microsoft Azure platform and was developed in partnership with the ICT service provider Info Support. During development, the most important aim was to create a user-friendly interface that is both secure and reliable. 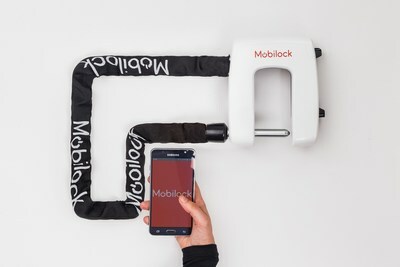 Aided by Info Support's pre-developed and professionally tested software, Mobilock was able to produce not only the world's safest bike lock but also the only lock in the world connected to the Internet of Things (IoT) via LORA technology. This enables shared bikes to be tracked and located anywhere and always in real time. It also makes it very easy to reserve, collect and return a bike to the authorised place designated by the bike's owner. "This method allows us to monitor whether a bike is returned in the right way and to the right place," Nieuwendijk resumes. "This helps to alleviate problems like lost and abandoned bikes, caused in particular and most recently by Chinese providers in various cities." The first Mobilock users are transport company Syntus, which has fitted its KeoBike shared bikes in the Veluwe region with the locks, and the German developer of Europe's largest bike-sharing scheme for electric carrier bikes, Donk-EE. Mobilock's ambition is to further expand internationally and, to this end, the company is in discussions with various international companies wanting to introduce shared-bike schemes for their employees. An important factor in this is the security of the lock. It is estimated that, in the Netherlands alone, between 500,000 and 750,000 bikes are stolen each year. The Mobilock bike lock is made from hardened tool steel and has a steel chain with a locking pin to lock the bike to something. The quality and thickness of the steel make the lock impossible to break with a saw or bolt cutters. "The use of shared bikes is only possible if the lock is truly secure, certainly in cases where expensive electric bikes are used," Nieuwendijk concludes. "That's why the ART4+ quality standard is so valuable to us and a world first."